The ultimate goal of the new Graco Reactor 2 E30 for spray foam insulation is to improve the entire application process by providing the best equipment to prepare the materials the way they were intended to be used by the manufacturer, in every step of the process. The Reactor 2 E30 makes spray foam insulation applications run smoother, with better results and improved product access and information that contributes to even less down time. 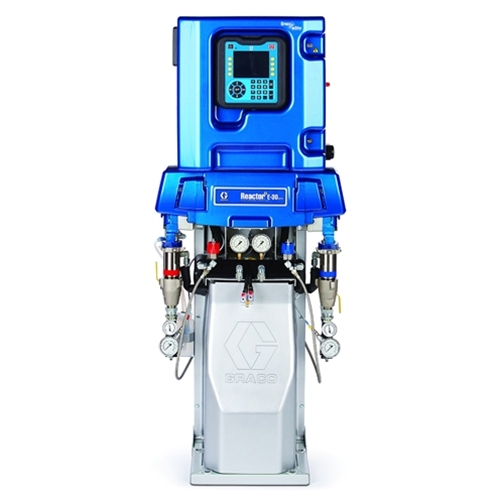 The new design of the Graco Reactor 2 E-30 features the 15 kw heater, as well as easier access that allows for faster identification of issues and completed repair service. The more compact design takes up less space in your rig and also while being stored when not in use- Up to 40% less space than a traditional reactor would take! Spraying performance outshines the traditional application by electric reactors, and your equipment will be less likely to experience issues with advanced electrical and circuitry systems as well as QR codes for faster fixes. Choose the set up that fits your spray foam insulation jobs best with the combination of available Graco E 30 Reactor packages that feature the 15 kw heater. The unit can be purchased alone as the bare machine only, or as part of an integrated system that is out of the box and onto your job site with limited set up in between. The Graco Reactor 2 E30 with the 15 kw heater can be purchased with the Fusion AP gun or with the Fusion CS gun, as well as with the Probler P2 spray gun. Packages include a 10 foot whip hose, the 50 foot heated hose with the scuff guard and also the mixing chamber where appropriate. Shop online or order by phone with Intech Equipment and Supply. Our outstanding relationship with the pros at Graco has earned us a spot as one of the Top 20 Distributors for three years running. Allow us to assist you in product selection and to ensure that your equipment is being used as intended to maximize the return on your investment.